Social Media has made a massive difference to marketing for small businesses. And many successful businesses have been built on the back of social media. But one of the biggest mistakes I see people make is to treat social media as their primary sales channel. You’ve probably seen them. The endless promotional posts. The constant spamming in Facebook groups. It smacks of desperation. And it’s a massive turn-off. Now of course there’s nothing wrong with letting people know about your product, service, open day or offer. It can be very effective. But relying on it as your only or main way to reach potential customers is a shortcut to failure. Let me tell you a secret – most successful businesses get a tiny fraction of their sales directly from social media. What those businesses do is integrate social into an overall marketing strategy. They are using social channels to share their blog posts and boost their SEO. Running Facebook adverts to grow their email marketing lists. Remarketing to their website visitors. All those hours you’ve spent cultivating a lively Facebook page or beautiful Instagram feed can be wiped out in a moment. It only takes one rule violation or a malicious competitor to wreck all your hard work. A few years ago many small businesses grew up on the basis of great organic Facebook reach. There was even a debate about whether you needed a website any more. Then came the algorithm change and suddenly page posts were reaching less than 10% of fans. Remember that Facebook et al are businesses. They need to make a profit – and they’ll do whatever is necessary to achieve that. Why do you go onto social media? To see what your friends are up to? Pass 10 minutes while waiting to pick up the kids? Cheering yourself up with a cute cat video? To get noticed you are going to have to stand out through all that noise and distraction. At least at a wedding fair you know that people are there because they want to find suppliers. Social media can be very untargeted. And how many of your fans are actually potential clients? Or are most of your followers other businesses? Great for building your network – but not for sales. Everyone talks about engagement on social media. 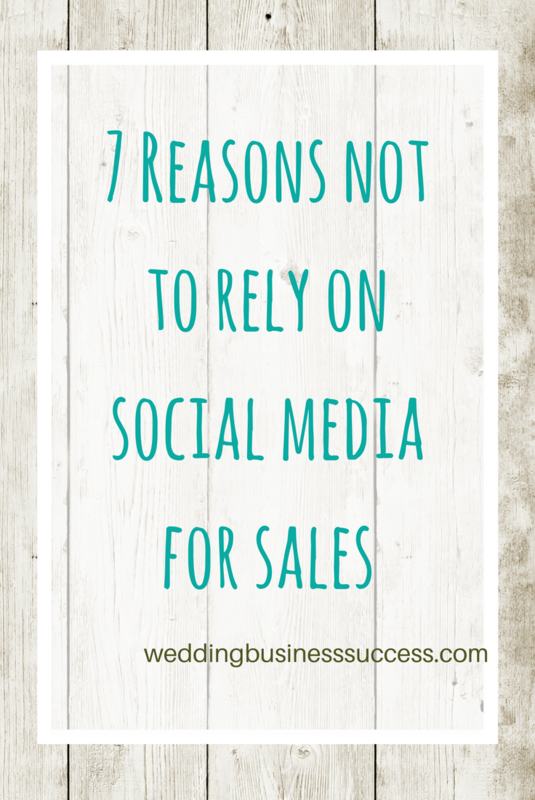 And one thing’s for sure – if you only add “buy my stuff” type posts your engagement will be negligible. So we all know we have to mix the sales type posts with the things people engage with. Which takes time. Lots of time…..
And that time becomes a problem as you grow. Let’s say all your effort on social media has paid off and you now have a full order book for the coming season. You’re rushed off your feet working on weddings. But unless you continue to invest in your social media, those enquiries will dry up and next year you’ll be back to square one. 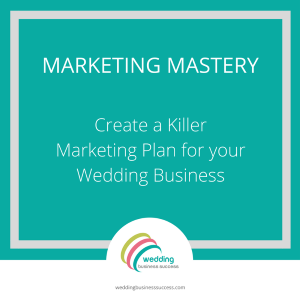 Unfortunately in the wedding industry you don’t get much repeat business! You need a constant flow of new couples finding your product or service. It’s become much harder to gain any traction on social media without paid advertising these days. And as that happens, more and more businesses are investing in advertising as a way to reach their fanbase and prospects. Which means that competition for those advertising slots is increasing and driving up the costs. Larger businesses can employ digital agencies to manage their Facebook adverts. With large budgets and experts managing their campaigns, the small operator can easily get squeezed – or end up paying way too much. Doing more on social media doesn’t always get you more business. If you are already posting 2-3 times a day on Facebook and Instagram, doubling that activity won’t double your sales. Social Media is fantastic for building brand loyalty and awareness, but that’s still no guarantee that people won’t just head straight for Google when it actually comes to making a booking. So stop thinking about it as a direct sales channel and start working on integrating it into your overall marketing.